I had never heard of a pangolin before last week. What did I learn? These incredible creatures are the most hunted animal on the planet. They are also totally bizarre. I’ve seen them described as medieval anteaters, modern-dinosaurs, walking pinecones, artichokes with legs, nature’s backhoe and armored Pokemon. Let’s go ahead and talk about why pangolins are so awesome (and weird). Pangolins are the most trafficked animal on the planet, which is why they need our protection. There are eight species of pangolin spread over two continents, Africa and Asia. All eight species range from Vulnerable to Critically endangered. Last Wednesday, 182 nations of the Convention on the International Trade in Endangered Species (Cites) unanimously agreed to a total ban on international trade on all species of pangolin – a decision that received much praise around the world. 1) Pangolins walk awkwardly on their hind legs, using their tail for balance. 2) When pangolins are frightened they curl up into a tiny, strong roly poly ball. 4) Pangolins don’t have any teeth. Instead, they use their sticky tongue to eat insects. 5) A pangolins tongue can be longer than its body. 6) Speaking of insects, pangolins can consume more than 70 million ants a year. 7) Baby pangolins are carried on their mother’s tail or back. 8) 20% of a pangolin’s weight is comprised of scales. 9) More than 10,000 pangolins are trafficked illegally each year. 10) Pangolins ears and nose have special valves that close when ants attack. 11) The pangolin’s large scales are made of keratin, like our nails. 12) Nobody knows how many pangolins are left or how long they live. Sources: The Telegraph, World Wildlife Fund, World Pangolin Day & Nat Geo Wild. Her name is Rambo, she lives in New Zealand, she takes pictures, and, oh yeah… she is an octopus! In a new viral video released by Sony, you can see Rambo in action, snapping pics of excited guests in exchange for treats – using Sony’s underwater Cyber Shot TX30 camera. Rambo, who was given the name based on the amount of destruction she caused the first few camera set-ups, lives at the Kelly Tarlton’s Sea Life Aquarium in Auckland. Rambo may be the world’s first professional ‘octographer,’ given the fact each photo costs $1.50 a pop! The truth is, octopuses are highly intelligent. They open jars, make daring escapes from their tanks, and even dismantle high tech equipment! Click here to watch an octopus break apart a camera. Octopuses learn quickly and are highly motivated by food. Rambo was first taught to respond to a buzzer – which meant snack time. Then Vette had to teach her the buzzer meant to take a picture, which resulted in food. Vette told NPR the hard part wasn’t training Rambo to shoot pictures; the hard part was creating an underwater set-up for the tank that the curious cephalopod wouldn’t destroy. How Does the Octopus Seamlessly Co-ordinate Its Eight Arms? Good thing octopuses don’t dance, because according to a new study, they have no rhythm. 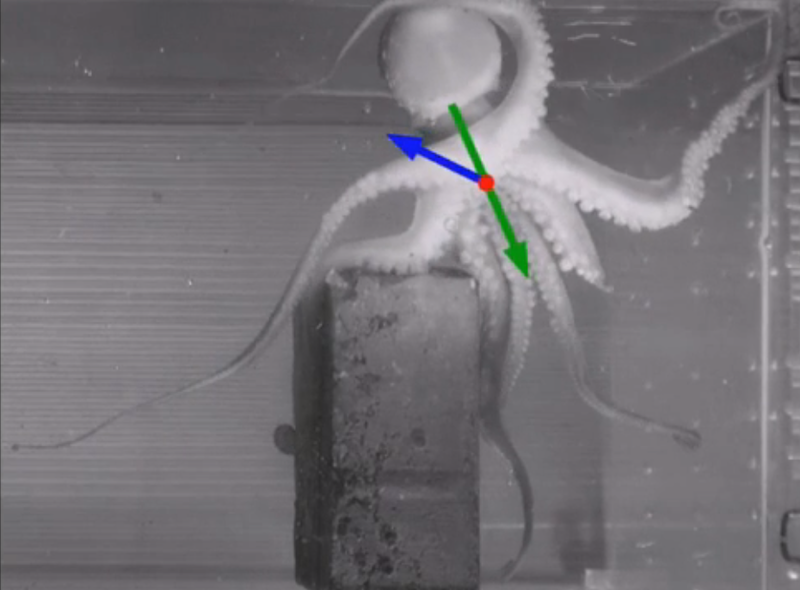 Researchers from the Hebrew University of Jerusalem used high speed cameras to film octopuses moving around their tank – then analyzed the footage frame-by-frame. What they discovered surprised them. Scientists found that the octopus moves by shortening and elongating its arms, which creates a pushing thrust. The animal does not move by bending or pulling its arms, as previously thought. Octopuses have bilateral body symmetry, which means their left side is a mirror image of their right. Most bilateral-symmetric animals face forward when they are moving (except the crab, which walks sideways.) But, octopuses can move in ANY direction without needing to turn their bodies. They just push off a surface and propel themselves wherever they’d like. While, the octopus clearly has some rad moves, researchers have not been able to spot a pattern, or rhythm to their movement. Levy believes there either is no pattern to discover, or their movement is too complicated for the studies they conducted. The findings are published in the journal Current Biology. Hope You’re Not Afraid of Spiders, Because This Species Can Change Color! A species of crab spider has the ability to slowly change color based on its background. More specifically, the female whitebanded crab spider changes from white to yellow (and the reverse) to ambush prey when hunting. The crab spider’s color-changing abilities have been detailed for the first time in a new scientific paper, published this week in the journal Ecological Entomology. Gary Dodson, a Ball State biology professor, and Alissa Anderson, who graduated with a master’s degree in 2012 from Ball State, were the first to measure the rate of color change in the whitebanded crab spider (Misumenoides formosipes). Using Adobe Photoshop, researchers measured the color-changing process of various female whitebanded spider crabs. They discovered that white spiders had a much easier time switching to yellow, versus yellow spiders changing to white. It is possible morphing from white to yellow is less physiologically damaging than the reverse. FUN FACT: This species of crab spider exhibits one of the most extreme examples of sexual size dimorphism across all animals. Females, which are the size of a ‘fat kernel of corn,’ are 20 times larger in mass than males. Have you ever wanted to be recruited by Xavier’s School for Gifted Youngsters? Well, that’s not terribly realistic, but you can totally LOOK like an X-Men! 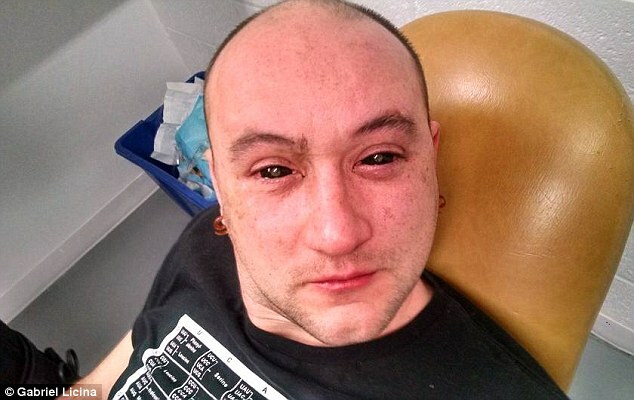 New night enhancement eyedrops were tested by a group of independent researchers known as Science for the Masses, based in California, with lead researcher Gabriel Licina as their guinea pig. These liquid black drops are a simple combination of Chlorin e6 (Ce6) and insulin in saline, with the addition of dimethlysulfoxide (DMSO). The drops were based on a patent filed in 2012 that claimed this mixture, when applied to the eye, will absorb to the retina and act to increase vision in low light. Eyedrop Chemical Breakdown: Ce6 has light amplification properties, and has been used as a therapy agent in cancer treatment. The insulin is used to allow absorption of the Ce6 into the chamber of the eye. DMSO is used in cell preservation and in medication application. In this case, its primary ability is to cause increased permeability of the cellular membrane, allowing free passage for the chemicals in the eye drops to reach the eye. 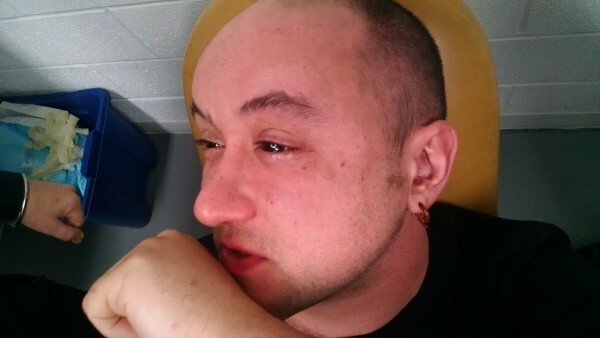 Licina’s eyes were flushed with saline to remove any micro-debris or contaminants. Then they were actually pinned open to remove the ability to blink. Ce6 was then added to the eye via micropippette. After the drops disappeared he was given special lenses and black sunglasses to ensure increased low light conditions and reduce the potential for bright light exposure. Licina and four subjects from the control group (people who did not use the drops) were taken to a ‘darkened area’ for testing. 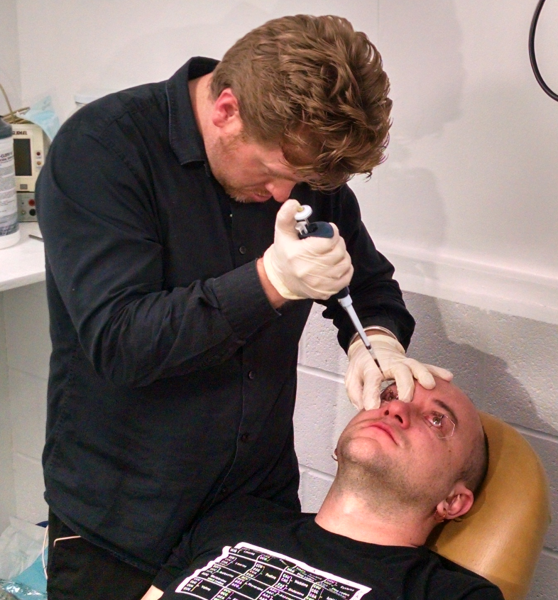 Three forms of subjective testing were performed. These consisted of symbol recognition by distance, symbol recognition on varying background colors, and the ability to identify moving subjects. Turns out, Licina’s special vision allowed him to recognize symbols the control group couldn’t see! The Ce6 drops allowed Licina to identify distant figures 100% of the time, while the control group got it right just 33% of the time. But, as cool as this experiment sounds, these revolutionary drops have people worried. Increased light amplification may cause damage to the eye if used improperly. Science for the Masses stresses the fact they conducted this experiment for research and informative purposes only. So don’t try this at home. CLICK HERE to view the full report from Science for the Masses. We are familiar with amphibians and reptiles that can change color, but this frog can actually change the texture of its skin! This unique feature makes it the only vertebrate known to do so. Dubbed the ‘Punk Rocker’ frog, or Pristimantis mutabilis, the marble-sized amphibian lives in the rain forest of Ecuador. It was discovered by scientist Katherine Krynak in 2009. According to National Geographic, Krynak spotted the frog while on a nighttime walk, and decided to bring the thorny specimen back for closer observation. Once she got home, she saw the frog was slimy and smooth, not what she expected! Eventually, the spines reemerged, and Krynak realized she had made an incredible discovery. Scientists believe the shifting skin texture serves as a form of camouflage in the wild, helping the frog blend into its mossy environment.